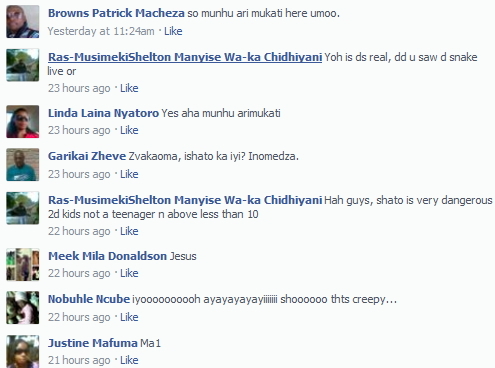 A South African Journalist, Linda Laina Nyatoro shared this scary picture on her Facebook page yesterday. She said it happened very close to Durban North in South Africa. 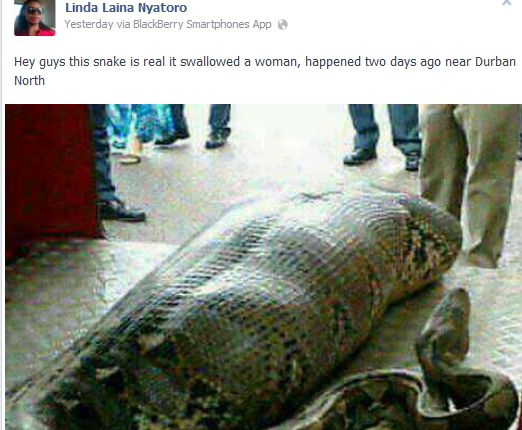 According to her, the snake in the above picture swallowed a woman alive. Though she didn’t provide further details but she said it’s true. Ntandazo Luthuli When ever u hear the sound# sssssssssssssssSssSss run 4 your life . Internet no go kill usoooooooooo, this 1 na real demonic snake. God! !! !!! Prove urself let the whole nation know dat u are the beggng and the end. God prove urself……. HOPE THIS A MERE GIST? Man and the dangers arround him. Is it 4 real OMG!!! Are you really serious? Mere looking at the snake’s head, one would find it difficult to believe that a creature with such tiny head could swallow a human being just like that. I thought it bites and kills its prey via its poisonous venom and later eats the prey; I never knew it swallows large creatures too, and not small animals. God save us o! It is rare, but surprising. I heard the whole story on this one. It may seem surprising what these serpents are capable of. This was on old snake, very large indeed. When they reach this age they are not capable of restricting their prey very easily. 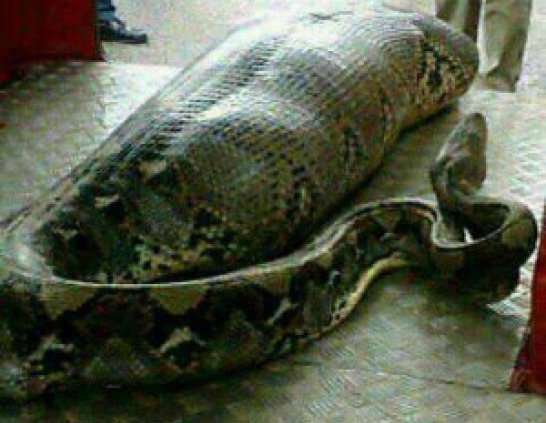 The poor girl involved was clearly overpowered, and the snake would have swallowed her alive. this is incredible.i cant believe that small headed creature could swallow a full fledge human.its unbeliveable. God,,,,,,,,,,,,,,,,,,,wat kind of scary news is diz????? Goshhhhhhhhhhhhhhhhhh!!!!!!!!!!! Snakes are capable of swallowing feet first. Large pythons like this can swallow entirely starting from the head.